Update 13 March: The Tevatron experiments have just released new, stronger limits on the mass of the Higgs boson. Read about it here. 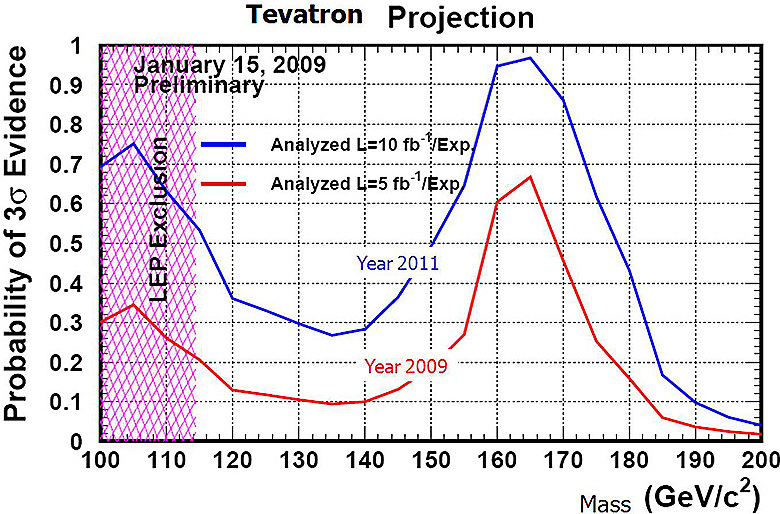 There have been a couple new results from the Tevatron this week. The first result, shown by both CDF and DØ experiments, is the observation of single top production. The top quark was first observed in 1995 by the same two experiments, but that observation was of top pair production (a top plus its antiparticle). This discovery was of single top quarks, with no antiparticle partner. In the Standard Model of particle physics, top pair production occurs roughly twice as often as single top production, and the top pair signal is also somewhat easier to see in data. The observation of single top production is important, because even though everyone expected the process to exist, demonstrating sensitivity to such a rare and difficult signal is an important milestone on the way to searches for even rarer processes, like production of a Higgs boson. The other result is the most precise measurement (by a single experiment) to date of the W boson mass, by DØ. Whereas the single top measurement demonstrates increasing sensitivity to the Higgs, the W mass tells us what mass of Higgs boson we might expect. Since the mass of the W is supposed to come from the Higgs mechanism, a more precise measurement narrows the window of likely Higgs masses. The mass of the Higgs has interesting implications for current searches at the Tevatron and the upcoming searches at the LHC, because the Higgs may be more difficult to see depending on its mass. The chances depend very strongly on the actual mass of the Higgs boson, which no one knows. Depending on what the mass of the Higgs boson is, it will decay into other particles that are easier or harder for an experiment to detect. So for example if the mass turns out to be about 170 GeV, the Tevatron experiments say their chances are almost 100 percent of finding it by 2011. If the mass turns out to really be 135 GeV, the chances are below 30 percent. What drives this behavior? In general, the heavier the particle is, the fewer of them will be produced. In general, a rarer signal is harder to see. But the likelihood of finding the Higgs does not decrease smoothly as the mass increases. This is because we can’t see a Higgs boson directly: we can only see its decay products, and the mass determines which decays are allowed. The Higgs prefers to decay into heavier particles when they are available, but the heavier decay products (like pairs of massive W and Z bosons) are only available to a Higgs whose mass is high enough. (A particle can’t decay into something heavier than itself.) Some of these decay modes are easier to see than others. Let’s look at a few examples. For a very light Higgs (115 GeV is the lower limit that has been excluded by previous experiments), the Higgs is too light to decay into Ws or Zs, and so it decays into the next lightest particles in the standard model: bottom quarks and tau leptons. Unfortunately, both of these decays are very difficult to detect. Bottom quarks are copiously produced in proton collisions, because their mass is small compared to the energy in the colliding particles. So the fraction of b quarks coming from Higgs decays is a tiny fraction of all the bs we see. There is a tiny signal on top of a huge background. Adding to the confusion is that we can’t see single quarks by themselves in the detector. Instead they give rise to jets of many particles, and we aren’t always successful at tagging these jets as coming from a bottom quark. Taus can also decay to jets, and we have a similar problem there, since identifying tau jets can be difficult. Taus can be even harder to reconstruct since some of their energy is always carried away by an invisible neutrino, which makes the measurement more error-prone. In fact, in this low-mass region, the best way of seeing a Higgs boson might be through its decay to two photons. As I said before, the Higgs prefers to decay to more massive particles when possible, and photons have no mass. In fact, this decay must proceed through an intermediate high-mass particle, which makes it relatively rare compared to the decays described above. The Higgs only decays this way about 1/1000 of the time, but when it does, we can catch it if we can measure the energy of the resulting photons very accurately. See here for an excellent summary of DØ’s attempt to observe this process. However, since this measurement involves seeing a very small peak above a very large background, the measurement is only really possible if we have a lot of Higgs decays to observe (something the LHC’s large luminosity will help with) and a detector with a very good electromagnetic calorimeter to measure the photon energy. For example, the CMS electromagnetic calorimeter has been built specifically to see this signal, and has a better energy resolution for photons than its competitors at the Tevatron (and for that matter, its competitor at the LHC). Above, we can see how the tiny bump in the two-photon mass spectrum is only visible if we can sharply resolve it. For higher masses, things get slightly easier. Once the Higgs is heavy enough to decay to two Ws or Zs, we can start to look for the high-energy electrons and muons that come from W and Z decay. In a channel like the Higgs decaying to two Zs, and each Z then decaying to two muons, there are a total of four energetic muons in the detector. The possibility of four high-energy muons created by chance in any other kind of interaction is relatively small. The signal is larger compared to the background, and the Higgs is easier to see. In fact, the region that the Tevatron experiments have started to become sensitive to, around 170 GeV, is in this region. Watch for more news on this front from the Tevatron experiments as their dataset grows. For high masses (above 180 GeV) the plot dips again. Here, the large mass of the Higgs starts to work against the Tevatron, since the chance of producting such a heavy particle starts to become too small to accumulate a large sample of them. In this region, the LHC has an almost insurmountable advantage: since the energy of the incoming protons will be many times larger, the production of a heavier Higgs would be much more likely. Eventually, the LHC experiments will be able to confirm or deny the existence of the Higgs over the entire mass range up to the TeV (1000 GeV) scale. One final note: everything above assumes the ordinary, vanilla Higgs particle predicted in the Standard Model. However, if supersymmetry or other exotic theories turn out to be true, there can be all kinds of other Higgses: multiple Higgses, little Higgses, even invisible Higgses. In many ways, these alternate scenarios are even more interesting, and at the LHC, we’ll be on the lookout for all of them!